John Waite has led an amazing life. From his early days as a child living in a cottage in the English countryside and listening to heroes like Marty Robbins to fronting bands like The Babys and the 80s super-group, Bad English. Then theres his incredible solo career which includes hits like "Change, "Every Step of the Way, "In Dreams and of course, "Missing You" - which hit #1 on Billboard's Hot 100. One of the things Waite has always wanted to do was release a folk/country acoustic album. And although he did give fans a taste of one with 1997s "When You Were Mine, Waites new four-song EP, "Wooden Heart (Acoustic Volume 1) really delivers the unplugged element while taking Waite back to his musical roots. With a band that features Waite, Shane Fontayne (guitars/mandolin), Tim Hogan (bass) and Rodger Carter (percussion), "Wooden Heart clocks in at just under fourteen minutes in length. But to the listener, the air of fragility in the delivery of Waites performances are worthy of self-reflection, in addition to multiple listens. 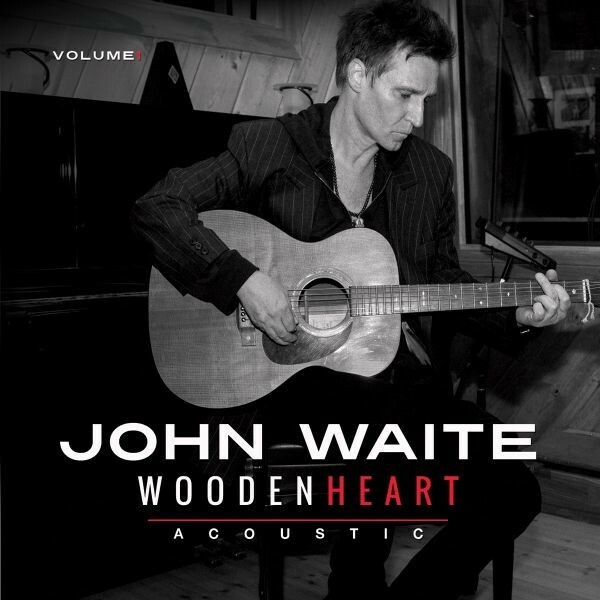 As a whole, "Wooden Heart  Volume One (Acoustic) is a well-crafted extended play, and an album that showcasesJohn Waite at his real, raw and emotional best. I recently caught up with Waite to get his thoughts on "Wooden Heart and more. What made you decide to do an acoustic album? After releasing the BEST CD earlier in 2014, I realized my favorite songs on the compilation were the acoustic ones. Once you make a retrospective like that, it clears the way for something new. I had actually been toying with the idea of a folk/country album for a long time. "When You Were Mine" (1997) was close, and this felt like an extension of that. Singing with an acoustic guitar is where I started from, so I've gone full circle. It's all more intimate and real. I prefer it that way. How much of an influence did your musical upbringing have on this album? When I was a kid, cowboy music was huge and America was just a dream - a myth. Marty Robbins sang of shoot outs, loners, high noon and riding off into the sunset. When you're five, that's an incredible thing to take in. Cowboys are close to rock singers. Can you tell me a little bit about the songs on "Wooden Heart? Two of the songs are Richard Thompson songs. He's a master really. Ive always wanted to sing "A Heart Needs a Home. "Withered And Died is a fragile, hurt performance on the original, so I had to make it tougher. Sort of like tinkers sitting round a campfire passing a bottle and telling stories. I wanted it to be a little over stated. What are your plans for touring and future projects? The future seems to be filling up with electric gigs. In fact, more dates just came in this week. I'd like to do some dates with the band playing acoustic. We'll have to see. Right now, I'm in the middle of a second acoustic release. These days a lot of artists have been doing these "super group packages. You were one of the pioneers of this movement with Bad English. Have you ever given thought to doing another one of those kinds of projects? All of the bands sound alike to me. But there are still young bands who are coming up with new ways to write and play. The future is theirs, and it should be.